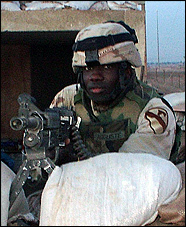 Army Sergeant Ernso Auguste was wounded in March of 2005 in Iraq while guarding a location occupied by Army military officers and Iraqi officials who were in a meeting. Auguste and others were guarding the building’s perimeter and checkpoints when a vehicle sped toward them and exploded. Auguste’s initial injuries included severe rinfing in his ears, confusion, and severe feet and back pain. He was taken to a Combat Support Hospital for treatment. SGT Auguste, who served with the 3rd Battalion 82nd Field Artillery (Red Dragons) out of Fort Hood, Texas, has been diagnosed with anxiety disorder, a Traumatic Brain Injury (TBI), tinnitus, and bilateral knee, ankle, and back injuries. Among the commendations awarded to Sergeant Auguste were the Army Lapel Button, Army Commendation Medal (2nd award), Army Achievement Medal (2), Global War on Terrorism Expeditionary Medal, Global War on Terrorism Service Medal, Army Good Conduct Medal, National Defense Service Medal, Army Service Ribbon, Combat Medical Badge, and Driver/Mechanic Badge. Sergeant Auguste, his wife Tamika, and their two children were gifted a home in Lake Worth, Florida. Sergeant Ernso Auguste and family. Sergeant Ernso Auguste and wife Tamika.